I’ve said again and again that I don’t accept society’s definition of success. I’ve gone on and on explaining that I don’t always value what we’re supposed to value. I like to try to maintain my own definition of what makes a person successful and therefore happy, of what is worth working for. But let’s face it, sometimes it all comes crashing down around you, sometimes it’s just too much effort to think the happy thoughts that keep you aloft and the pixie dust wears off. And then you feel discouraged. I’m sure it happens to everyone, it comes and it goes. But discouragement is of no interest to anyone, so I’ll give you this instead. 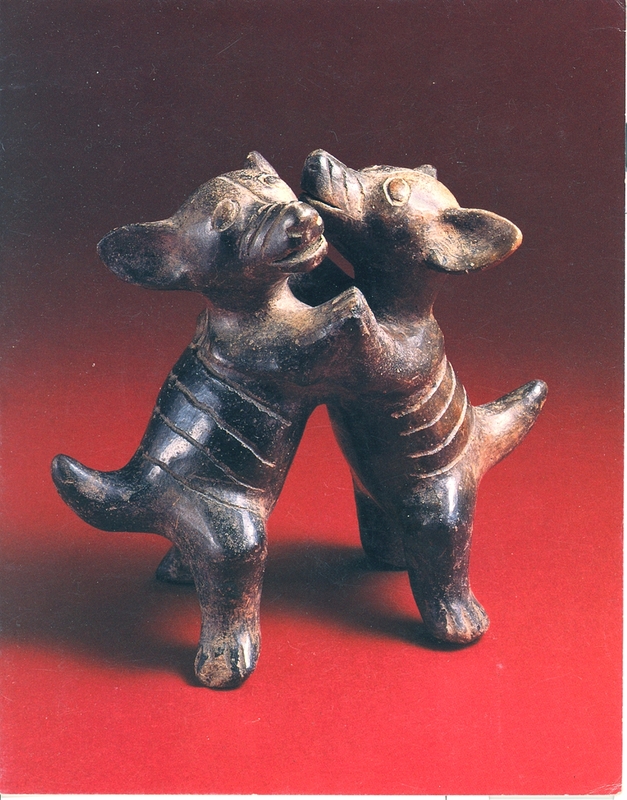 It’s dancing dogs! It’s from 200 BC! It’s from Jalisco, which is in Mexico! It makes me so happy that somebody took the time to make this. It’s so beautiful and joyful and perfect in every way. You can see the original at the Princeton University Art Museum, which is a wonderful place. And today’s Sunday interactive playlist is an easy one. It’s dancing songs, songs about dancing or songs that make you feel like dancing. It will help us all get through these dull grey January days. And here’s a roasty juicy soup with nice plump butter beans in it and a good dollop of pesto on top. Not hard to make and very tasty. The boys ate it with pasta, as a sort of sauce. Here’s a link to your interactive play list. Add what you like or leave a comment and I’ll try to remember to add it for you. Preheat the oven to 425. Cut the top and bottom off the squash and cut it in half lengthwise. Scoop out the seeds. Place the squash face-down on a baking sheet. Roast until the squash is soft and dark – 40 – 45 minutes. Let cool and then scoop out the flesh. Warm the olive oil in a large soup pot over medium heat. Add the shallot, ginger, bay leaves and garlic. Cook until the garlic starts to brown – a minute or two. Then add the rosemary, sage and thyme and the white wine. Cook a minute or two until it’s reduced and syrupy. Add the butternut squash and break it up with your spoon. Cook and stir for a minute, then add the tomatoes and enough water to cover by about 1/2 inch. Cook for about 10 or 15 minutes, until everything is warm and soft. Add the nutmeg, balsamic and butter. Remove the bay leaves and carefully blend or process about 3/4 of the soup. You want some texture. Return to the pot and add the butter beans. Stir in and heat till everything is warm through. Serve with a dollop of pesto and some grated smoked gouda, if you like. 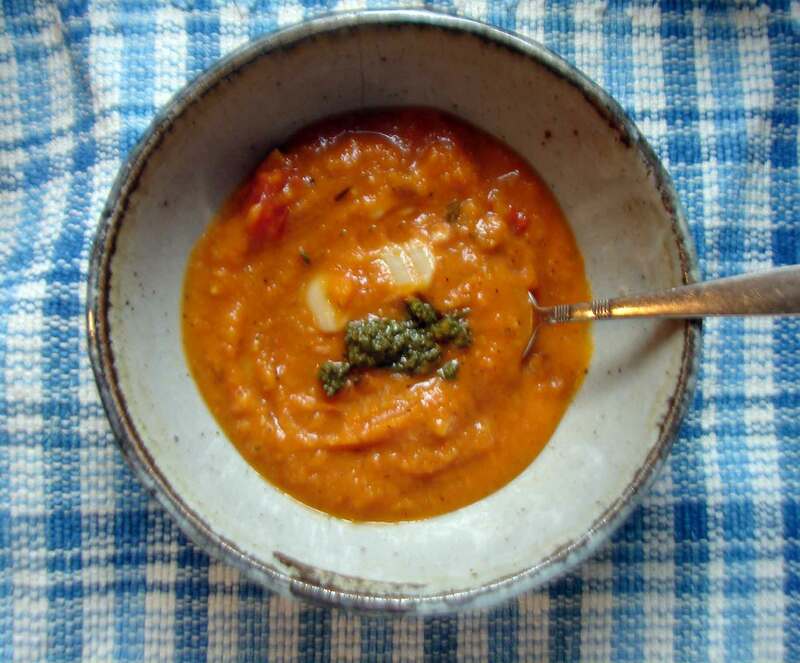 This entry was posted in beans, recipe, soup, tomatoes, Uncategorized and tagged butter bean soup, pesto, roasted soup, tomato soup, winter squash soup by Claire. Bookmark the permalink.